National Barn Company provides all types of "Post-Frame Buildings" also known as Pole Buildings or Pole Barns. These structures can be used for a variety of purposes, from garages, to horse barns, to riding arenas, to hay barns, to homes. National Barn Company has constructed more than 15,000 buildings in 27 states since 1992. National Barn Company is a full-service business, providing customers with custom building designs, building kits and construction. National Barn Company specializes in providing a complete building solution, from concept to finished construction. Each pole barn or horse barn is custom designed to meet the client's specific needs. National Barn Company is also unique because we will design, manufacture and deliver all of the material to your construction site before we process the first payment. The Perfect Solution For Garage Buildings & New Garage Construction. Check out what National Barn Company offers. National Barn Company has been building garages for over 20 years. We understand all the in-and-outs from planning to quoting your garage. 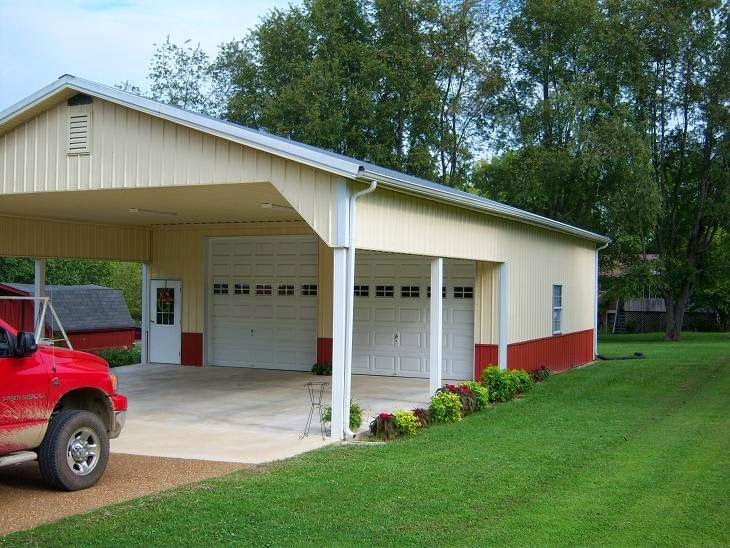 Our pole barn style Garage buildings as seen in this article can be customized to fit your exact needs. So no matter what size, option, or detail, we're pretty sure we can get your garage building planned, quoted and up in no time. Look at our garage photo gallery here. Simply click our "Quick Quote" request and we'll get back to you right away with a no-obligation estimate. We look forward to building your garage very soon.